What is E2S? 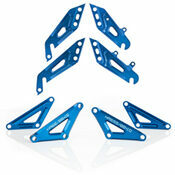 E2S - or Encapsulated Suspension System, is the name of our patent pending concept. Why encapsulated? The lower tubes of the swingarm, the ones which resist the most lateral forces during pedalling and cornering, are encapsulated between two super-stiff CNC machined parts. Why? This encapsulation allows us to weld the lower tubes of the swingarm on a surface 11 times larger than a standard design increasing lateral resistance by 36%. As a result, you the rider will pedal more efficiently and accelerate faster because the amount of energy produced during pedalling will be more directly transferred into the traction of your rear tyre. You will also corner and ride rougher terrain with more precision and more confidence because your rear wheel will be precisely where you want it to be. The Deubel 2UP has easy-to-tune aggressive geometry with interchangeable shock mounts and dropouts for head angle, bottom bracket height and chain stay length adjustability. 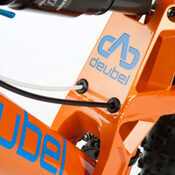 Two sets of interchangeable shock mounts, high and low, allow you to drop the head angle from 66° (recommended for All Mountain riders) to 65.5° (recommended for Downhill riders) and the bottom bracket height from +16mm (recommended for All Mountain riders) above the wheel axle to +10mm (recommended for Downhill riders) by simply swapping the shock mounts. This geometry is based on the use of a 160mm fork. 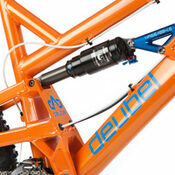 Visit the Geometry page for specifications regarding a 150mm fork. Same method for the dropouts, simply swap over the 2 sets of dropouts, short and long dropouts, so the chain stay length increases from 420mm (recommended for All Mountain riders) to 440mm (recommended for Downhill riders). You think a single pivot suspension is too simple to be an excellent suspension platform? Think again! Do you want a suspension platform which minimises the suspension compression when you accelerate? Do you want a suspension platform which keeps absorbing rocks, roots and holes under heavy braking? Do you also want a very sensitive suspension system over small bumps, a constant plush/predictable suspension system on medium shocks and a bottom resistant suspension under heavy impacts? Do you want a suspension platform which reduces chain growth when suspension absorbs a shock so that the shock absorption doesn’t slow you down? Well, if you combine all of those characteristics into equations - the laws of physics will tell you the exact location of the ideal pivot point of the Deubel 2UP suspension platform, how to tune the RP23 rear shock and where to locate the rear brake calliper. Add our E2S patent pending, a super stiff 15mm diameter aluminium 6061T6 axle plus a pair of large strong sealed pivot bearings and you have an excellent suspension platform. Great reliability. Super-easy maintenance. Now that's precisely what you want! 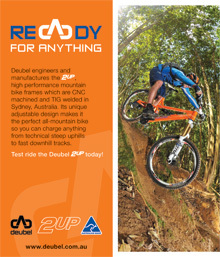 Those four key features have been addressed in the Deubel 2UP suspension design to help you climb more efficiently, descend faster and handle rougher terrain. The Pedal Bob, the unwanted suspension compression appearing during pedalling, has been minimised in the Deubel 2UP suspension system to transfer the maximum amount of energy to your rear wheel under acceleration. The Bump Absorption, the wheel path, the absorption curve and the low-leverage ratio have been optimised to provide you with plush suspension in all situations. The Pedal Feedback, when pedals rotate backward during shock absorption because the distance between the rear wheel axle and the bottom bracket increases, has been engineered so your pedalling rhythm won't be slowed when your suspension absorbs obstacles. The Brake Jacking, the unwanted compression or extension of the suspension under braking simply doesn’t exist on the Deubel 2UP, because of a specific brake calliper mount which gives you the maximum grip when you need it.